As of Tuesday, John Bolton asserted that Israel has eight days to launch a military strike against Iran's Bushehr facility. Why the hurry? Because according to Bolton, after the Russian nuclear fuel is loaded, any attack would spread radiation and thus poison the environment and harm civilians. And as we all know, Israel would never want to harm innocent civilians! Perish the thought. As long as John Bolton says so, it must be true! Iran is to bring online its first nuclear power reactor, built with Russia's help, on August 21, when a shipment of nuclear fuel will be loaded into the plant's core. At that point, John Bolton warned Monday, it will be too late for Israel to launch a military strike against the facility because any attack would spread radiation and affect Iranian civilians. ...But when asked whether he expected Israel to actually launch strikes against Iran within the next eight days, Bolton was skeptical. "I don't think so, I'm afraid that they've lost this opportunity," he said. So let's say that eight days go by and nothing happens. What turn might the narrative take? How about Oh Phew! Thank goodness Israel controlled itself. How selfless and peace loving...? It seems to me Bolton made these remarks to convey that no matter what happens *after* these eight days go by, Israel shall be blameless for any nuclear fallout, because Israel wanted to strike Iran *before* the nuclear fuel arrived [at the nuclear energy facility that is in full compliance with international law]. 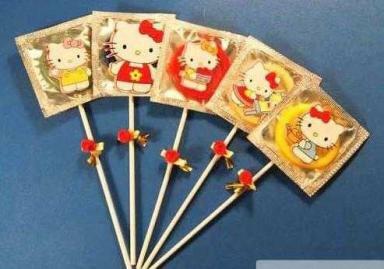 Prophylactic Logic: Totally Cute, 100% Fun, and 0% Risk!! Remember, nothing is ever the psychopath's fault. • Not to blame: Not only do they never accept culpability, but psychopaths will also manufacture proof that puts others at fault. Will the US have a false flag? It seems more likely to me given these developments. It would be helpful for Israel if the US acted in "self-defense." That would help keep Israel blameless, just like John Bolton's remarks help set up a narrative. 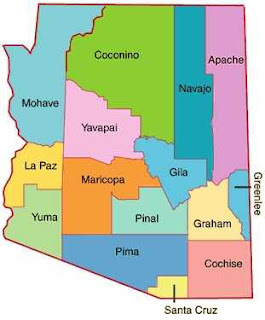 In Pinal County Arizona, local law enforcement report that Mexican drug cartels have literally taken over a corridor running up to Phoenix, and law enforcement is overwhelmed. This report is from June 14, 2010. "We are three counties deep. How is it that you see pictures like these, not American with semi and fully automatic rifles. How is that okay?" asked Pinal County Sheriff Paul Babeu. Babeu said he no longer has control over parts of his county. "We are outgunned, we are out manned and we don't have the resources here locally to fight this," he said at a Friday news conference. Five weeks ago Deputy Louie Puroll was ambushed and shot as he tracked six drug smugglers. Sheriff Babeu said the ambush mirrored military tactics. Mexican military and U.S. law enforcement are finding large quantities of military weapons stashed all along the U.S. Mexican border. [SOURCE:] A Mexican high ranking army officer has told the U.S. Border Fire Report that weapons and forward type military positions are being discovered on both sides of the border. "our Intel indicates that Los Zetas paramilitary units and many of their weapons have moved into positions on both side of the international border with the U.S. My troops along with U.S. personal just in the last few days have found weapons and ammo hidden near the Mexican border with Arizona". The Zetas are preparing to advance north with well trained and well armed Los Zetas paramilitary solders this fall according to sources. They will be transporting drugs and illegal's along the drug corridors that lead into the USA and go as far north as Phoenix Ariz. These Zetas have said in the past they will be protecting their loads against all comers. [SOURCE:] One Zetas commander said he has ordered his men to fire on anyone they see who is armed. There now seems to be no question that they have the weapons and man power to carry out their threats. This is just one cache of many that has been found along the border over the past year. There have been many more like this but you have not heard anything about them on the mainstream news. 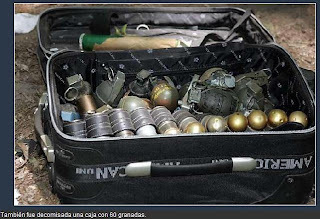 The following photo's received by the U.S. Border Fire Report from our sources are reported to be depictions of the combat weapons and ammo found near the Mexican and Arizona border in this latest raid along with other support vehicles, armored vests, explosive devices and other supplies. "Reported to be depictions" is not exactly clear, but click through to see the photos. I found this one particularly interesting. 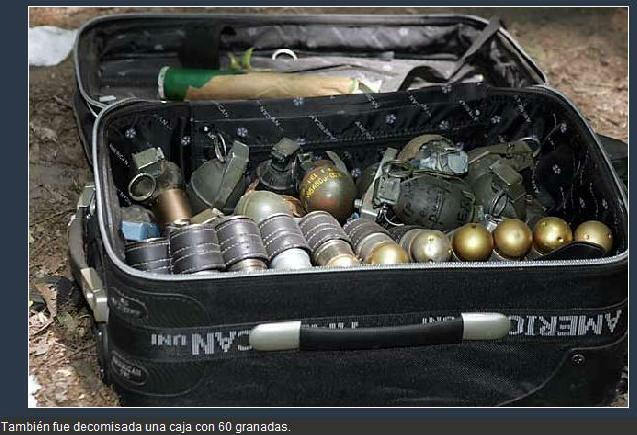 Caption: "More than 60 grenades of varies size were found with Middle Eastern writing on them." See: would a false flag have to come first? My guestimate is to expect a tewowist attack (blamed on Iran) before the kids go back to school. Maybe the primary reason the border doesn't get proper attention is because that is how we are smuggling our black operation supplies to their intended destinations. The political/emotional treadmill it creates for various demographics of Americans is just icing on the cake.